It's going to be Freddy vs. Bev in the upcoming Halloween episode of The Goldbergs and thanks to Robert Englund, we finally know when the show will air. Englund is back in full Freddy Krueger makeup for the special episode, which premieres October 24th on ABC. The surprise announcement that Robert Englund was back as Freddy took many horror fans by surprise who never expected to see the actor go full Freddy again, but now that the news is out, we all can't wait for The Goldbergs special Halloween event. 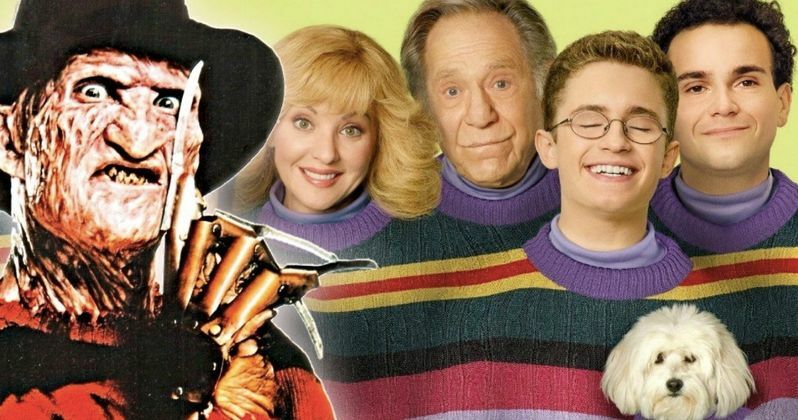 The Goldbergs Halloween episode is titled Mister Knifey-Hands and it pits Wendi Anne McLendon-Covey's Beverly Goldberg up against Freddy Krueger in her dreams after Adam watches A Nightmare on Elm Street against her wishes. The set up sounds perfect for the return of Robert Englund as Freddy Krueger. Englund had this to say about the upcoming episode of the show on social media. "Had the pleasure of joining Adam F Goldberg's '80s time machine The Goldbergs for their special Halloween episode. Krueger's back! It's Freddy vs Bev! Oct 24 on ABC." In addition to announcing The Goldbergs Halloween special premiere date, Robert Englund also shared the new photo of him in full makeup with Wendi Anne McLendon-Covey's Beverly Goldberg, recreating one of the most legendary images of Freddy from a photoshoot used to promote A Nightmare on Elm Street 3: Dream Warriors. Englund posted the new image alongside the real photo with actress Heather Langenkamp. The latest photo has been used several times to promote Englund's Freddy return, and it's the perfect way to get fans aware of the upcoming episode. Robert Englund hasn't revealed how Adam F. Goldberg persuaded him to join the cast of The Goldbergs for the special episode, but it really doesn't matter at this point. Goldberg is clearly a fan of Englund's and the A Nightmare on Elm Street franchise, so this is more than likely a dream come true for him, along with horror fanatics all over the world. Englund summed it up best by stating that his return is a "spooky valentine" to the fans, which is probably the best valentine ever given to a horror fan. In addition to the Elm Street Halloween special of The Goldbergs, Robert Englund is also making a couple of horror convention appearances over the next month. He appeared at Monster-Mania last weekend and appears at the Alamo City Comic Con next in San Antonio, Texas during the weekend of October 26th - 28th. In addition, Englund is traveling to Germany to take part in the Weekend of Hell from November 3rd - 4th in Dortmund. The 71-year old actor keeps plenty busy these days, but fans would love to see him do some more projects that concern Freddy Krueger. Who knows, maybe The Goldbergs was the spark that will ignite more appearances. You can check out the premiere date announcement below, provided by Robert Englund's Instagram account.